The longest river in the southwest, the Colorado River is features the scenic “Upper C” float trip section near Kremmling and the fun whitewater of Shoshone Rapids near Glenwood Springs. Colorado River rafting trips have enough whitewater rafting choices variety to satisfy boaters of all ability levels. The Colorado River opens up to a gorgeous park-like valley and to our Upper Colorado Scenic Float section, meandering through vibrant meadows strewn with wildflowers and precipitous mini-gorges. Eagles soar in search of prey as trout feast from the depths. One of the most scenic and secluded regions in Colorado, rafting in the Upper Colorado River valley reveals massive canyons and dreamlike vistas. With natural hot springs scattered along the high desert paradise, the Upper C offers a relaxing float trip for rafting, ideal waters for beginner kayakers and some of the finest float-fishing waters available. Read more about Upper Colorado River Rafting. 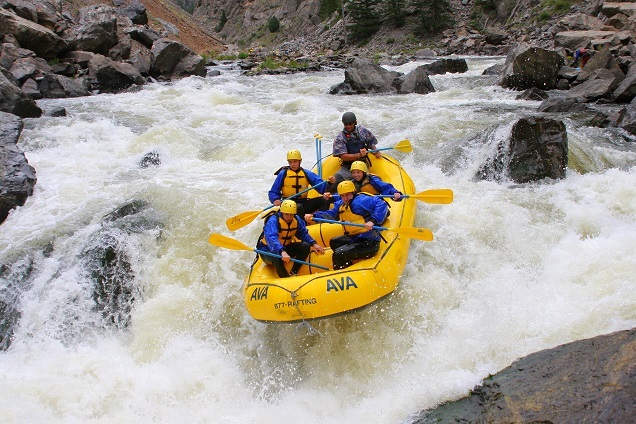 Join Breckenridge Whitewater Rafting for an overnight trip on the beautiful, wild and scenic Upper Colorado River. With time to play, relax, reconnect and enjoy, you won’t want it to end! Shoshone Rapids offers an exciting day of whitewater thrills through the Shoshone Rapids and breathtaking beauty beneath the majestic walls of Glenwood Canyon. Note: this trip is run by our partner company, Glenwood Adventure Company. Read more about Colorado River rafting on Shoshone Rapids.